As business owners, myself included, we’re often focussed on growing sales and increasing profit, but sometimes it’s good to give as well as to receive. If you’re feeling inspired to give something back, can you donate to charity from your business? 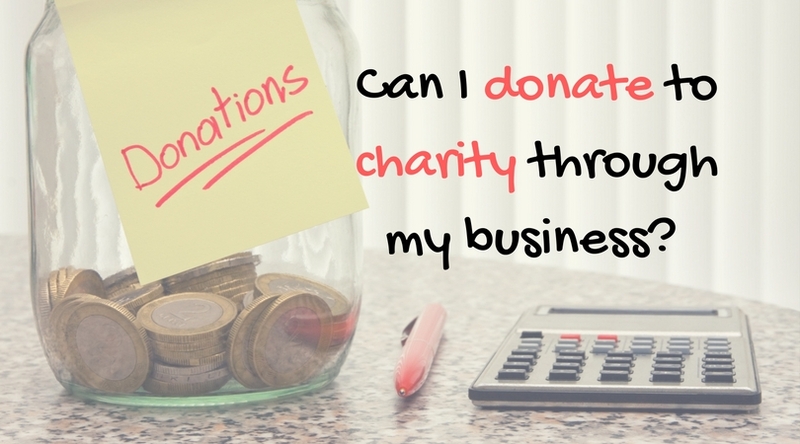 The short answer is yes – whether sole trader, partnership or limited company, you can make charitable donations through your business. Whether you get any business tax benefit from the donations is a different question and does vary depending on your trading structure. A limited company is a separate legal entity from its owners. Even though it’s your business and you may be the sole director and sole shareholder, it’s the company doing the donating, not you and that makes a difference. A limited company can deduct money donated to charity from the taxable profit which saves corporation tax for the business. There is a tax benefit in donating to charity. It’s not just charities that can benefit, community amateur sports clubs can also receive your company donations. It must be a genuine donations, not a loan, or a distribution of profits (such as a dividend) or have any conditions attached to it. If you get anything in return for your generosity, the value is limited to 25% of the donation up to £100. If it’s over £100 then there’s a £25 limit. If your donation is over £1,000 then anything you receive in return can’t be worth more than 5% of your donation value. These benefits don’t just apply to you as the director but also to anyone closely connected to you, such as a family member. Donations aren’t just restricted to money; a limited company can also donate equipment, trading stock (items it sells), land, property, shares in another company, employees (on secondment). It can also make sponsorship payments. Each of these has it’s own specific rules and limitations. They also differ as to whether the payments are part of the business expenses in the company accounts, or are just included at the corporation tax return stage. For a sole trader business, you and the business are the same legal entity. This means that even though you might be making donations from your business bank account, it’s still treated as though you personally donated the money. The same thing applies with partners in a partnership and company directors making donations personally rather than through the company. Unlike the limited company, a charitable donation won’t save tax for your sole trader or partnership business. In this case it’s the charity (or community amateur sports club) that can save the tax rather than your business. If you donate via Gift Aid the receiving charity can get 25p tax relief for every £1 that you donate. For a donation to receive Gift Aid, you often need to fill in a specific Gift Aid form for your chosen charity or at least tick a box to indicate that you want Gift Aid to apply. Any significant Gift Aid payments should be recorded in your personal tax return as part of self assessment. It’s important to make sure that you pay enough tax to cover at least the value of the tax relief on your Gift Aid. This is one to watch, especially for company directors with low dividends taking salary at the NIC threshold. If you don’t pay any tax than you can’t Gift Aid. You can still donate but without applying Gift Aid to your donation. If you’re a higher rate taxpayer, you can claim back the difference between the tax you pay and the basic rate for the value of your donations. If you donate £100, you can claim back £25. You can also claim for the current tax year, before it’s finished as part of your previous year tax return. For example you can claim back for donations made in 2017-18 as part of your 2016-17 tax return. Anything that goes into your tax return needs to be backed up with records and this applies to your Gift Aid donations too. Most charities send a yearly statement or summary so you need to keep hold of these to support your tax return figures. Payroll giving could be an option for any type of business that runs a payroll, particularly if there are a number of people that wish to donate. If you donate via payroll it has to be done via a Payroll Giving scheme, set up by a Payroll Giving Agency and it can only be to a charity, not a Community Amateur Sports Club. Donations are taken out before the salary income is taxed, so donating £1 to charity only costs you 80p at the basic tax rate. However, because the donations come out before tax, you can’t claim any tax back on Payroll Giving. Again donations from individuals aren’t just restricted to money, you can also give land, property or shares or donate money in your will. Everyone can donate to charity through their business. For a limited company it’s the business that receives the tax benefit. For donations that count as “personal” it’s the charity that can get the tax relief unless you’re a higher rate tax payer, when you get a share too. It’s not just money that can be donated however each type of donations has it’s own specific rules and limitations. So get inspired, choose your favourite charity or local sports club and you can support them through your business! If you’re not sure who to pick, here’s one that I support – Kiva provides loans to low-income entrepreneurs around the world.